What does the flood out of the serpent's mouth represent in Revelation 12? 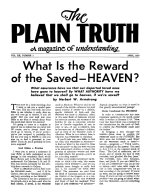 What Is the Reward of the Saved - HEAVEN? What assurance have we that our departed loved ones have gone to heaven? By WHAT AUTHORITY have we believed that we shall go to heaven, if we're saved? This may be a little shocking – but I want to ask you a candid question: Did you ever look into your Bible to see whether it really does say you will ever go to heaven, if you are saved? Did you ever look into your Bible to see what it reveals about what the saved shall inherit for eternity? It's going to come as a surprise to most of you to realize that you never did. Of course, you've always heard that you'll go to heaven, if you're saved you've just accepted it, probably – but did you ever stop to PROVE it - did you ever try to find it promised in your Bible?